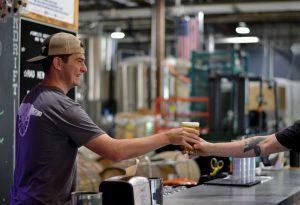 Our featured brewery this month is located in Norwood, Mass. It’s Castle Island Brewery, sound familiar? This industrial, yet cozy environment provides a fun, welcoming experience with communal tables and board games. Not to mention, they have delicious snacks from Mi Niña tortilla chips, Chico de Gallo salsa, Moody’s, to some Kalahari Biltong jerky. Yum! 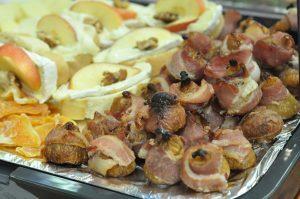 Depending on the season, they also have rotating food trucks, giving you a new experience every visit. Company Founder, Adam Romanow, fell in love with the industry when he dropped his boring desk job for a brewing apprenticeship. In May of 2011, he decided to open a brewery of his very own. Ronamow took his time to research locations and types of brews to ensure a quality brewery. Finally, in March of 2015, Castle Island found its home. They successfully turned an empty warehouse into the beautiful brewery it is today. They even pulled an all-nighter to brew their very first batch of beer. It was a long time coming, but it was the thoughtfulness and passion that has made Castle Island so well-known (and delicious). Now let’s get to the important part, the brews. Keeper New Age India Pale Ale: They really overloaded this brew with hops, including simcoe and cascade. Providing a balance with multiple malts, they packed a punch that even beginners can try. A smooth choice for pros. Hi-Def Double IPA: This IPA is full of fruity flavors. With bursts of melon, papaya, and tangerine, this beer is beautifully balanced with a touch of honey and heavy hops. Make this a year-round favorite. Candlepin Hoppy Season Ale: This is your beer for anytime and anywhere. 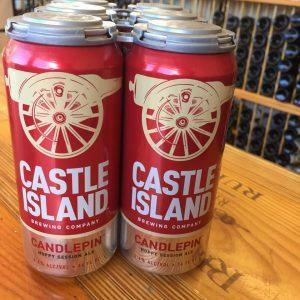 Candlepin is an easy, light brew with a mix of columbus and citra. Make this an addition to your next tailgate. Can’t wait to try them out? You’re in luck. 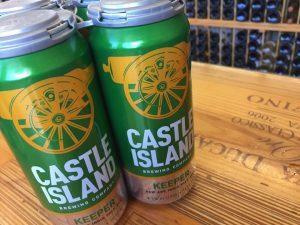 Not only can you visit Castle Island Brewery to get a taste, but we carry all four of these brews at Mystic Wine Shoppe! Stop in and find a new favorite. 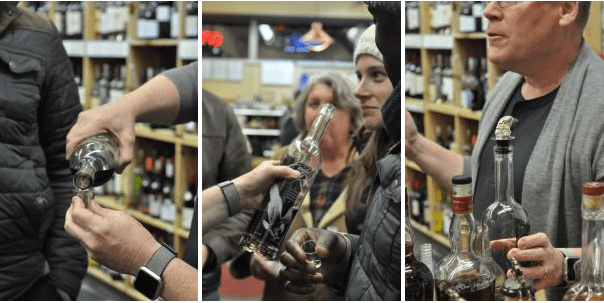 It was another successful Winter Whiskey tasting! We continue to be so very grateful for the support of this community! 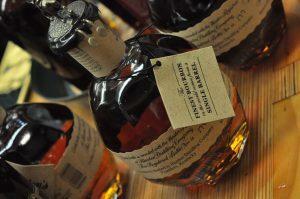 Guests enjoyed sampling six delicious Buffalo Trace Bourbons along with locally made snacks. 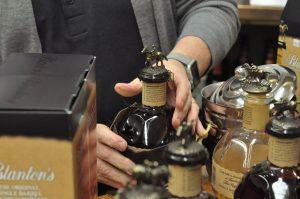 Everyone was engaged and learned a lot about different bourbons (including us). 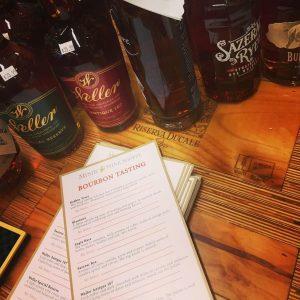 It’s an annual tasting that we LOVE to host and we can’t wait for next year. 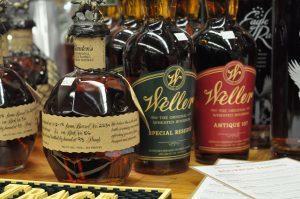 Thanks to everyone who came out and thank you to Buffalo Trace for sharing your Bourbon and knowledge with us. Thanks again to everyone who joined us! 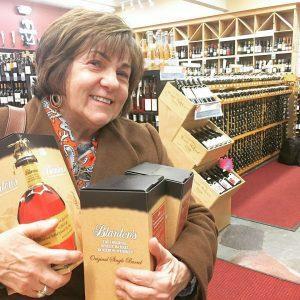 Make sure to visit us for our Friday Beer Tastings from 6-8pm and our Saturday Wine Tastings from 5-7pm. 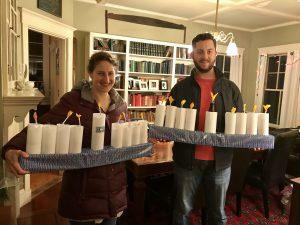 I’m not Jewish, but my husband is and, as is the case with holidays both secular and religious, it often falls upon the woman to create the traditions…which in my house means food. 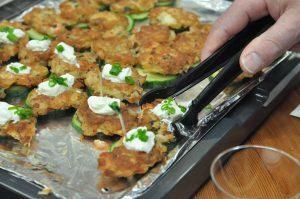 So it has come to pass that I, the non-Jew, have become an expert at making latkes. 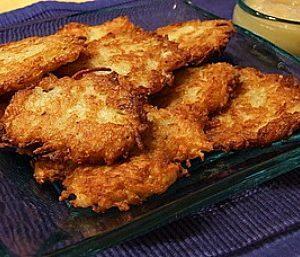 I think that the crisp potato pancakes are the one thing that Hanukkah has over Christmas. 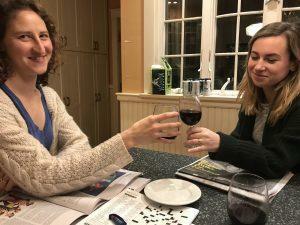 At our annual latke fry on Sunday, I grated both sweet and Yukon gold potatoes and served them with applesauce and sour cream, of course, but also with a hearty bowl of Portuguese kale soup and a romaine-free salad. The soup is robust and smoky with chorizo and kielbasa, kidney beans, sweet potatoes, tomatoes, carrots and kale. 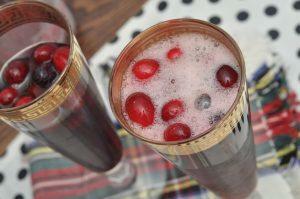 But it cries out for a substantial red wine to elevate it from peasant food to festive holiday fare. 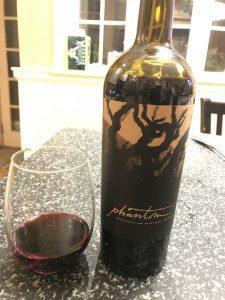 Bogle Phantom 2015 is just that wine. Don’t be intimidated by the label that proclaims “mysterious and hauntingly seductive.” This is a very approachable blend (44% Petite Sirah, 44% Zinfandel, 10% Merlot, 2% Cabernet Sauvignon) that pairs well with comforting winter dishes like beef stew, pork loin and…my kale soup. The girls and I opened it before dinner, let it breathe a bit and sampled it while pondering the New York Times crossword puzzle. Then we set the kitchen table and poured some for everyone. It’s smooth but bodacious, yet it doesn’t overwhelm the tongue with tannins. This will become the winter house wine here on Bartlett Avenue. Even my daughter (a millennial!) 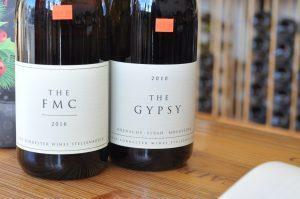 who tends to gravitate toward pinot noirs gave this wine high marks. 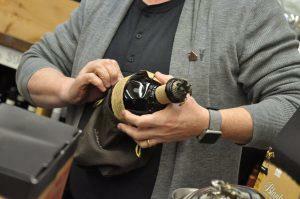 It’s loaded with subtle flavors and it drinks like a high priced bottle. Good thing we had two. The holiday season is officially here!! Are you in search of a great gift this holiday season?! We’re guessing you’re saying “um, yes of course… please help.” Don’t worry, we’re here to help with these 10 great gift ideas. Not seeing a gift idea you love? 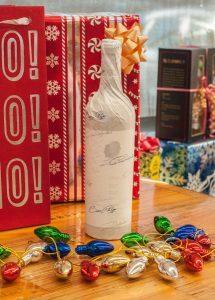 Head into Mystic Wine Shoppe and let our team of experts help you pick out the right gift. 1.Jim Beam Red Sox limited Edition Single Barrel Bourbon Gift Basket: This is the perfect gift basket for the Red Sox fan in your life! 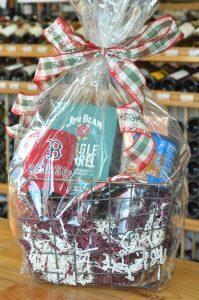 Not a Jim Beam fan, come and create your own custom gift basket! The Gypsy: The character is somewhat ‘wild’ a little brambly with hints of nutmeg, cinnamon, dark spices, with vanilla scents and a distinct, concentrated red-fruit focus. Great for laying down and keeping for at least ten years but already rewarding if allowed to breathe in a decanter. The FMC: The pinnacle of what we consider to be the finest expression of the grapes of this varietal – an icon chenin, a challenge to the world! Rich, layered with dried apricot, vanilla and honey. 3. 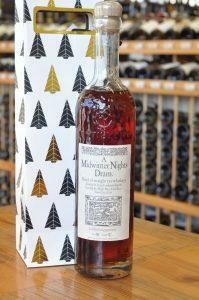 A Midwinter Nights Dram: A limited engagement with only 4 left!! This is a delicious blend of straight rye whiskeys. 4. 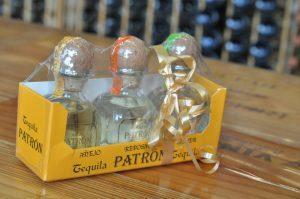 Patron Tequila Mini Gift Pack: The perfect stocking stuffer! 5. 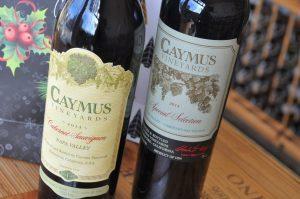 Caymus Vineyards Wines: Calling all cab lovers!!! Cabernet Sauvignon: This wine serves up a bevy of berry aromas and flavors. Its layered and rounded palate make it a delectable choice with a thick and mouthwatering grilled ribeye. Caymus Special Edition: A truly legendary wine, Caymus Special Selection is a wine that Cab lovers simply can’t get enough of. Introduced more than 30 years ago, Special Selection is a vivid expression of Cabernet Sauvignon from the Napa Valley. Starting with the foundation of their Rutherford estate vineyard and then securing contracts for long-term farming control of vineyards across the valley, Caymus has been able to solidify the extraordinary character and over-the-top quality of this very special wine vintage after vintage. 6. 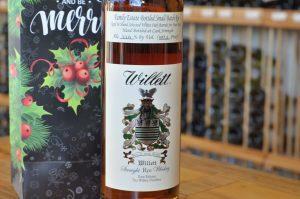 Willett Rye Whiskey: A special release!!! Even a quick nosing reveals that Rye nose of grassy, herbal goodness with a sweetness that follows it. The palate is well balanced with a herbal mintiness, intertwined with a sweetness that dances on your tongue until it exits with a spiciness. This is a great utility whiskey to drink neat, make an Old Fashioned, or hold up to a rock. 8. Opus One Wine: The essence of time is expressed in Opus One by the character of each vintage. Place, often defined as terroir, represents the geography, the climate and the essential human element which is captured in the wine’s balance between power and finesse, structure and texture. 9. French Wines: Not sure which wine to choose, how about three delicious French wines… you can’t go wrong with any of these wines. 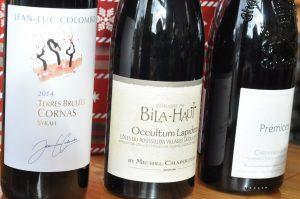 Terres Brulées Cornas Syrah: A deep ruby-black with purple hints. Blackcurrant, dark cherries and blackberries, with spices, licorice and cocoa on the nose. A very rich mouth-feel with flavors of black fruit, jam, vanilla, spice and mineral notes. This wine has firm tannins and a long lasting finish. Bila-Haut Occultum Lapidem: he Occultum Lapidem displays great dark garnet-red color in the glass. 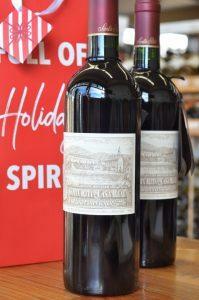 The nose is laden with aromas of black fruits, pepper, leather and graphite with hints of shrubs. On the palate, the fleshy quality of the wine is apparent straightaway from the attack. Rich and dense, the wine finishes with a balance of fruit and delicate tannins. Prémices: A pure, elegant style, with an alluring raspberry puree note leading the way, while light blood orange, red currant and plum fruit flavors follow close behind. Nuances of incense, mulling spices and rooibos tea flitter throughout. The finish is silky and persistent. We hope to see you soon at Mystic Wine Shoppe! Let us know what you think about this years gift guide! 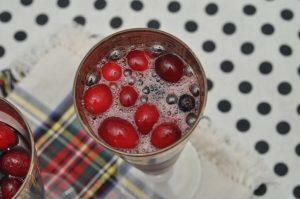 We’re getting into the holiday spirit with our November Cocktail of The Month! 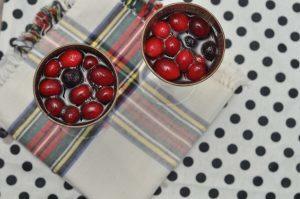 This delicious and easy-to-make cocktail is sure to be a holiday hit at your Thanksgiving table or at your holiday bash. 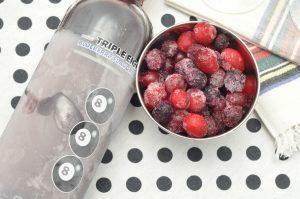 We hope you find this cocktail makes the perfect addition for your holiday get-together! If you’re looking for a great hostess gift, stop into Mystic and pick-up a holiday gift basket or charcuterie board. 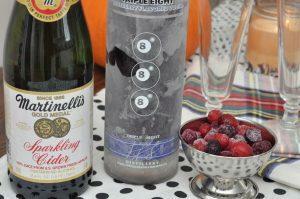 Not into cocktails, check out our Turkey Day Wine Guide! 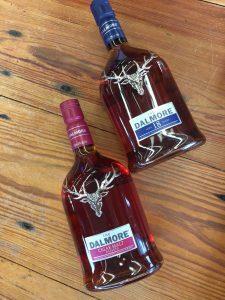 Are you looking for a smooth whisky that will have you craving for more? fruit aromas with finishing notes of orange, dark chocolate and spices. pairs perfectly with a fine cigar. 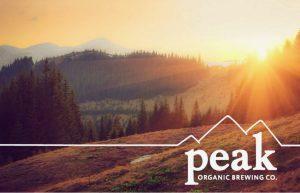 Brewery of the Month: Peak Organic Brewing Co.
Local, local, local! Peak Organic Brewing Co. is dedicated to creating the most fantastic brews straight from their designated, local farmers from all around New England. “The idea is simple. Find the best ingredients being grown to create amazing flavor and truly delicious beer.” Each farm that Peak utilizes focuses on quality versus quantity. Peak has a passion for sustainability rooted in the way they run their company. Peak likes to participate and dedicate its efforts to innovating new flavors that have never been done before. They achieve this by collaborating directly with their local farmers, chefs, and other organizations connected to sustainability as well. This company background and passion for being different, guarantees a unique, well-crafted taste when you give their brews a try! (If you’re a fan, you know that already! 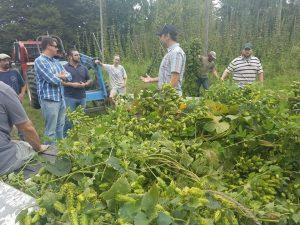 Here are some of the delicious, specialty beers Peak Organic Brewing Co. has to offer! Peak IPA: This is Peak’s classic, signature brew. Their India Pale Ale contains a flavorful initial taste thanks to the Amarillo and Simcoe dry hop. No bittering needed, just an abundance of floral and citrus flavors. The Juice: This WICKED dry-hopped pale ale provides aromas and strong zests of tangerine and berry notes. The carefully brewed mix contains amarillo, simcoe, and hints of Azacca hops. 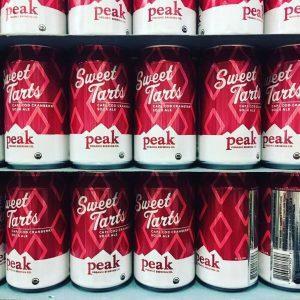 Sweet Tart Cranberry: We’re drooling just at the name of this brew. This Cape Cod Sour Ale ties together tangy, cranberry, and sour flavors into a refreshing first sip. 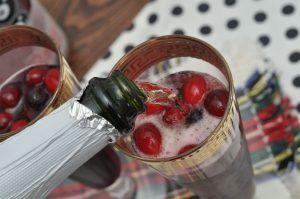 The locally sourced Cape Cod cranberries provide a special rose-like effervescence for this perfect, light-bodied brew. Winter IPA: ‘Tis the season! Peak’s hazy, New England Style IPA was created to lighten things up as the cold weather starts to hit. With a bright, juicy mix of Calypso, Azacco, Simcoe, and Citra hops, this brew will help you survive the winter by hinting at springtime. http://www.mysticwineshoppe.com/wp-content/uploads/2018/11/Screen-Shot-2018-11-07-at-8.11.05-PM.png 894 1420 Eric Faiola http://www.mysticwineshoppe.com/wp-content/uploads/2014/11/Logo_horizontal_2.gif Eric Faiola2018-11-08 21:39:442018-11-08 21:39:44Brewery of the Month: Peak Organic Brewing Co.
Thanksgiving is around the corner (we can’t believe it either)!!! Don’t procrastinate this year… get ahead of the game and shop our delicious wines that pair perfectly with appetizers, turkey, and dessert. 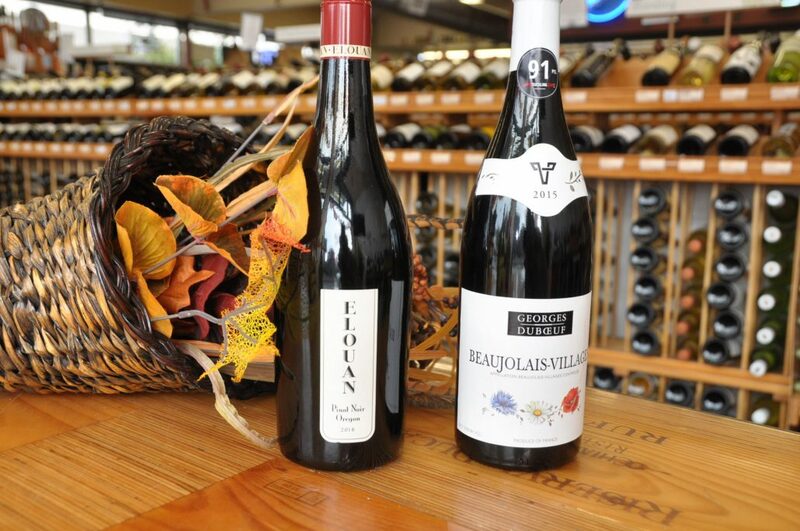 We’re making it easy for you with our Turkey Day Wine Guide! 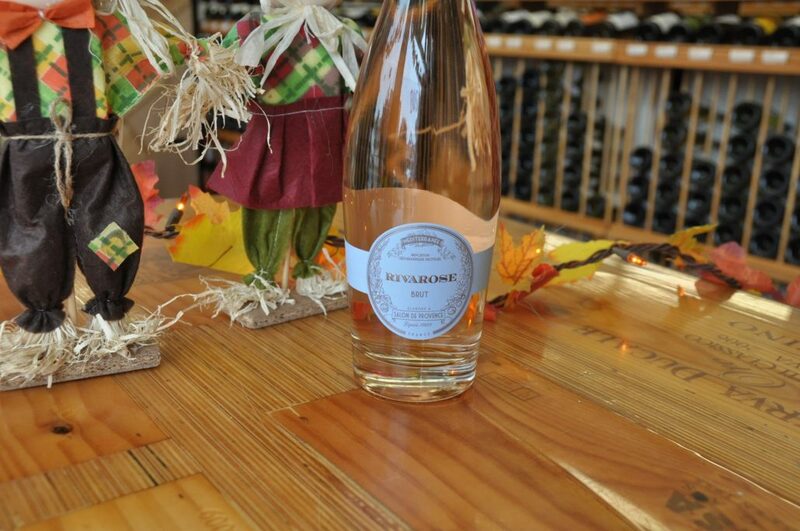 Riva Rosé is a delicious sparkling rosé from the Mediterranean. The wine displays delicate yet persistent bubbles. The nose exudes aromas of small red fruits such as strawberry and raspberry. 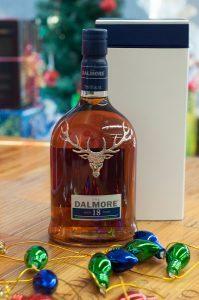 The palate offers refreshing notes of grapefruit and spice. Perfect for aperitifs and to possibly drown out the noise of your relatives… haha, just kidding! Elouan Pinot Noir Dark: Shimmering ruby red. Deep notes of plum, red cherries and blackcurrant jam with subtle touches of toasty vanilla and spice. 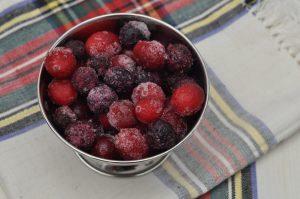 Rich, ripe fruit flavors of plum, cherry, mixed berry jam, and blackberry. Smooth tannins round out the mouthfeel. Beaujolais-Villages Sélection Georges Duboeuf: An intense, brilliant cherry color with purplish tints. Complex nose with red and blackberry aromas. A smooth wine with fine tannins, harmonious and complete. Along with a good red, we also love a good white wine to pair with turkey. Here are two delicious white wines from Trimbach. 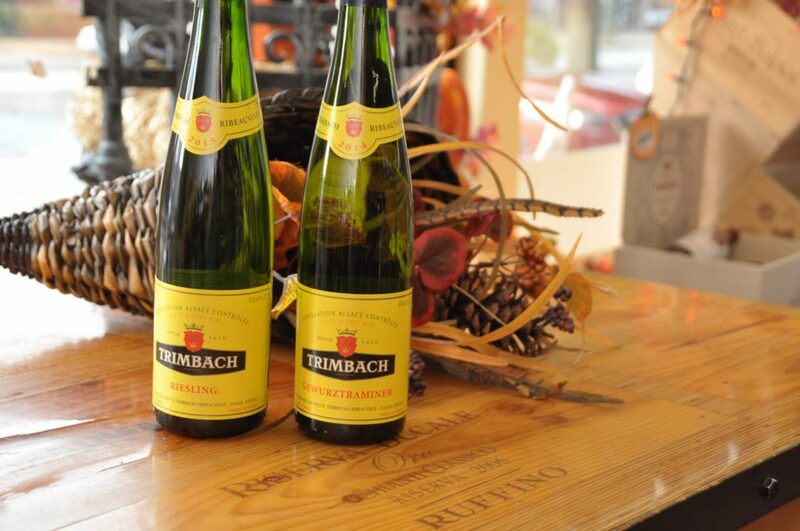 Trimbach Reisling: The nose shows restrained citrus and a slightly lifted, very slightly aromatic touch of conifer. The palate is taut and slender, presenting sober, clean citrus flavors. This stands upright and has a wonderful backbone of freshness. Trimbach Gewurztraminer: A very shy nose just releases the most teasing hint of peach. 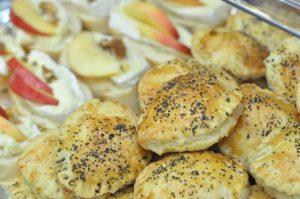 The palate is utterly restrained: peach flavors are dry and brightened by lemon and have a wonderful lightness of touch. The finish is dry, clean and long. 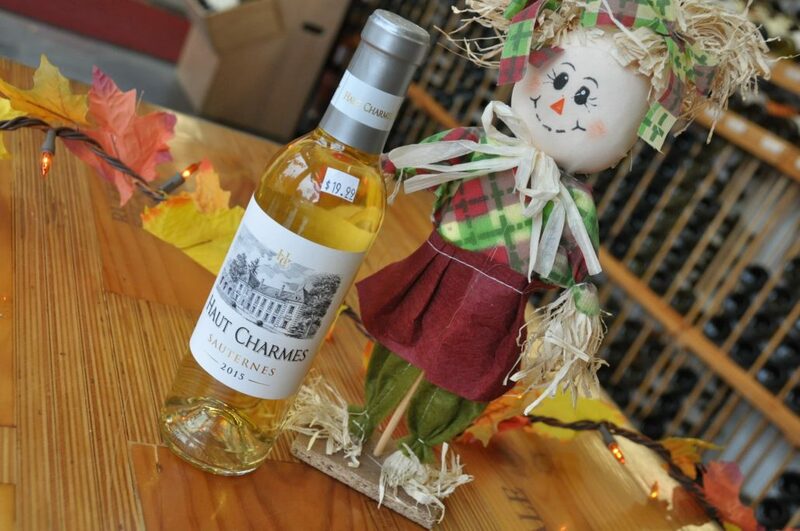 Haut Charmes Sauternes 2015: Haut Charmes is a very special Sauternes bottling, made from the younger vines of the region’s most legendary château. While we aren’t allowed to actually reveal the source, it’s safe to say its location in the Ciron Valley exposes the Sauvignon Blanc and Sémillon fruit to conditions perfect for the development of botrytis. Charming, elegant and an exceptional value for what’s in the bottle. Not in love with these wines?! Head on in and let us help you choose the perfect wine. Our educated staff is always happy to help!